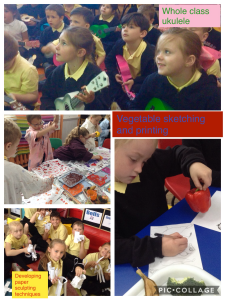 As schools across Wales are gradually gearing up for the new curriculum for Wales, Julia Walker, a teacher at Jenner Park Primary School in Barry, Vale of Glamorgan, is getting a head start. 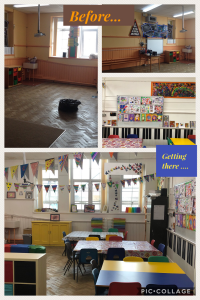 She’s using a new expressive arts room as a ‘laboratory’ to test ideas and approaches to help embed creativity throughout the school. Julia is the PPA (Planning, Preparation and Assessment) teacher at the school, as well as having responsibility for ICT and expressive arts. She’s also one of A2:Connect’s Arts Champions. So how did the room come about? Julia only knew she had the room just before the summer holidays, and when she found there was no money to pay to have the room redecorated, she did it herself after school, with the help of some colleagues! “I don’t have tables for every child to sit down at but that’s intentional. Pupils learn through a rolling programme – so in any one lesson, there may be a small group of pupils doing a collage together, some working on stop-motion films – making inanimate objects come to life, another group will be doing creative ICT perhaps on computers. And then the next week, they’ll swap, and take advice from the other groups as each gets expertise in a particular area. “The fantastic thing with this more creative, project-based approach to learning, is that once you’ve set up what they’re doing, you can step back a bit and let them take the lead. “Sometimes I find that, once I set them all off, I’m redundant! That rarely happened before. But as long as they’re aware of what they need to achieve, they’re all stay engaged, and on task. What are the benefits of having a separate room? “I’m the music specialist – a cellist – and all our instruments were kept upstairs in the hall. When I wanted to teach the Foundation Phase, I had to take all the instruments and arts equipment into a totally different building. “Now, I have all the instruments and arts equipment in this room with me. I have an art part with lots of arts materials, paints, collage materials, then a music part with all the instruments. “At the moment, it’s the room that makes the difference to the students, it sets up that expectation. They know that this is a place for collaborative learning. Do you have to have a separate room? “With this approach, you’re the facilitator rather than the teacher. You have to teach the skills first before they can apply it to the topic. I then tell pupils they’re going to become experts in that area, and they each really respond to that well. It gives your class a richer experience of the same topic or theme, whether it’s science or geography. 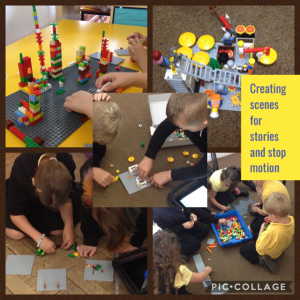 “The other week Class One was doing superheroes, and in the first week they were building a high-rise tower with tiny Lego which was creative and good for fine motor skills, and in the second week I introduced a maths element by starting to explore patterns, using different colours. Why is this approach better? “What inspires me, and confirms to me that this works, is the reaction of the children. They come up to me in the playground and say, ‘Have we got you today?’. They just love it. It’s not like a whole class art lesson, which some young people find tricky, it’s more like being explorers, they get a chance to dip into a lot of different skills before they go off and explore and start working on a final product. How does being an A2:Connect Arts Champion help? “With the new curriculum due in 2022, we’ll all have to change the way we teach because there is so much cross-curricular work, and the arts are so central to this. 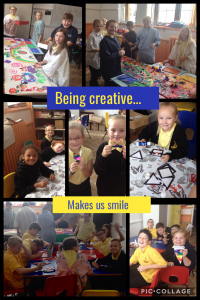 “Next year is a good year to become an arts champion in your school, especially as Estyn is recommending the temporary suspension of the inspection cycle for a year. Teachers could arrange themed afternoons or days, or themed projects with lots of different activities, creative IT, arts, craft, music, where they explore history, geography, and science through the arts. Would you like to find a creative practitioner to work with you in your school? Find your ideal match in the A2:Connect opportunities section (which we call ‘the App’! ).